Butternut squash…I feel like it is my mission in life to not only help others spend less on groceries, but also to know what to do with the groceries when they buy them. As autumn approaches, the prices of fall fruits and vegetables plummet. At our house, we do our best to take advantage of these savings by bringing more variety to our diet and eating seasonally. My oldest son once said “Wow, it’s like a party in my mouth.” after taking a bite of steamed butternut squash, garnished with a dash of brown sugar and cinnamon. I was just thrilled that he was so excited about eating the seasonal squash I’d prepared for my family! Here’s a perfect recipe for you to try this fall! 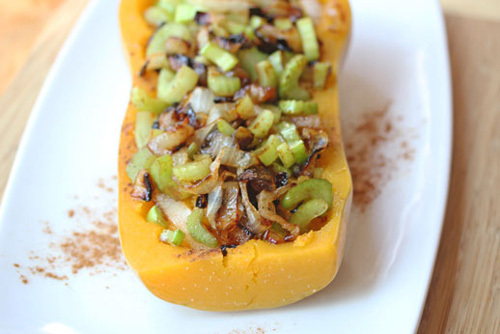 Cut squash in half, lengthwise and place flesh side up in a glass baking dish (9×13 inch). Add water and place uncovered in oven. Steam-roast for 45 to 60 minutes or until all flesh is tender. While squash is cooking, put olive oil, white sugar and balsamic vinegar into a small skillet; add onion slices and cook on medium heat for five minutes. Turn heat to low/simmer and cook for another 30 minutes, stirring occasionally. Once the onion mixture is caramelized, combine with celery. Scoop out the flesh of the cooked squash and mix with butter, brown sugar and cinnamon. Place the squash mixture into a serving dish, adding the caramelized onion and celery mixture over the top. Do you have a favorite way to prepare butternut squash in the fall? If so, I hope you’ll share it with me. I make a squash dish, cut squash in half , stuff with dressing (like turkey stuffing) tie the two sides of squash together with string, roast in oven, 400 for about 30 minutes. It is delicious, and makes the house smell like a turkey is roasting. I am vegan so this is my swap out for turkey. I love squash, but I always have trouble getting my kids to try it, even when I sweeten it up with brown sugar. I know a couple of quick recipes that I know they’ll reliably eat, but squash is tough. Maybe I’ll have better luck with something savory like these carmelized onions?